We have begun our advocacy efforts on the City and State level for funding and policies for FY2020. March 4th, an intrepid group of NYCCAL members went to Albany to meet with State elected officials and NYCCAL will have some members testifying at City Council hearings in the coming weeks. We will be planning borough rallies to take place in April and May. We will also be using Twitter and Instagram to draw attention to our asks. Sign up for our mailing list and check out our Action Alerts to join us in our work. 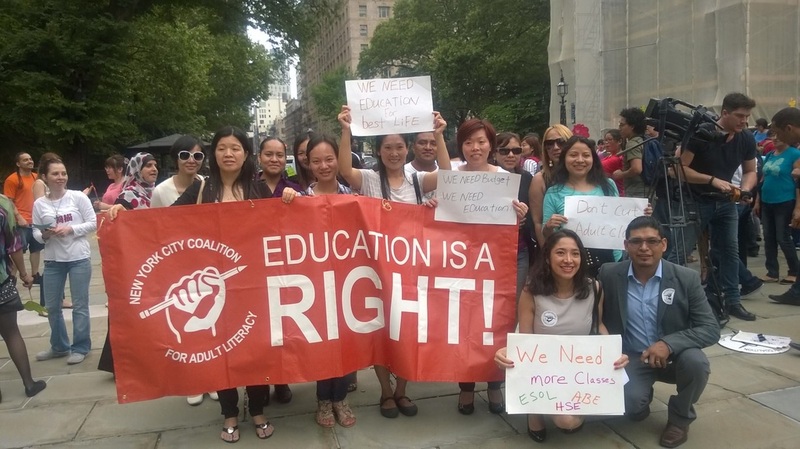 On Wednesday, June 6, over 1,200 of our students, teachers, program staff, advocates, and allies filled the blocks outside City Hall to send a clear message to the New York City Mayor, Bill De Blasio, about the importance of funding Adult Literacy. We have had many NYCCAL rallies over the years, but this was one of the best yet, with over 30 participating organizations, fantastic student speakers, and creative signs. And perhaps my favorite moment, the crowd participation in the closing song, “Imagine” by John Lennon. We were also joined by Council Members Mark Treyger, Carlos Menchaca, Chaim Deutsch, Deborah Rose, and Margaret Chin, and a number of media outlets. The fight isn’t over, so the NYCCAL Advocacy Committee will continue to try to coordinate a presence at City Hall to lobby Council Members in support of adult literacy as they enter and exit budget negotiations- let us know if you’d like to participate in that. Adult Literacy Receives $12 M in FY 18 City Budget! On June 6, 2017, the city budget was voted on and passed by the New York City Council. Based on the budget documents & press releases we’ve seen so far, we are confident the $12m for Adult Literacy is in the budget. While the funding was not baselined, this is a significant victory that we can build on moving forward. We will continue to work in the days and weeks ahead to see what is possible in terms of rate adjustments, so stay tuned. Thank you to everyone who participated in the advocacy effort—all your hard work paid off! NYCCAL would also like to thank all our elected representative who supported this initiative. 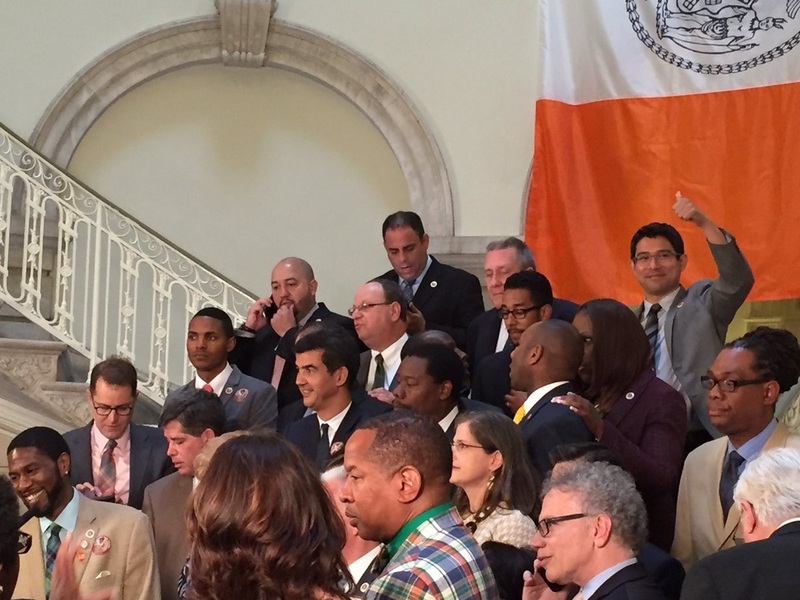 A special shout out to New York City Council Member Carlos Menchaca, Finance Chair Julissa Ferreras-Copeland, and Speaker Melissa Mark-Viverito. 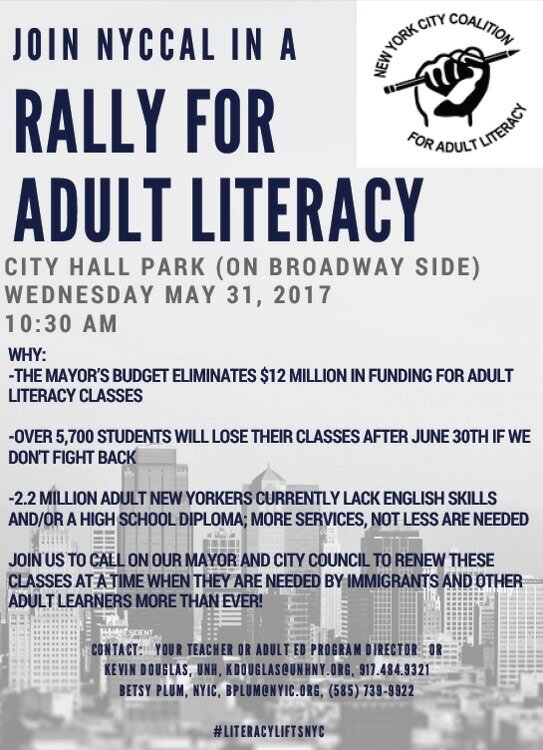 Over 800 immigrants and adult learners will gather for a press conference and rally at City Hall Park on May 31st at 10:30am to call demand the Mayor restore funding for community based adult literacy classes. This rally is the culmination of a series of similar rallies held in Brooklyn, Queens, and the Bronx over the last month, designed to draw attention to the 5,700 students across the City whose classes are currently slated for closure in the City budget. The press conference and rally are organized by the New York City Coalition for Adult Literacy (NYCCAL), a citywide coalition of community based organizations, CUNY programs, libraries, and union training programs. Students, teachers and allies will be joined by Public Advocate Letitia James, Council Immigration Chair Carlos Menchaca, Council Members Alan Maisel, Mathieu Eugene and other elected officials. ​2.2 million adult New Yorkers currently lack English proficiency and/or a high school diploma – 1/3 of the entire adult population of the city – yet the Mayor’s Executive Budget cuts $12m in funding from adult literacy classes included in last year’s budget. Literacy programs provide a pathway to economic mobility, social integration, parent-child engagement, improved health outcomes and improved community safety. However, these programs are dramatically underfunded and less than 3% of those in need can access adult education programming. A 2015 survey by NYCCAL revealed at least 15,000 New Yorkers were on waitlists for adult literacy classes where they sometimes waited for over a year. 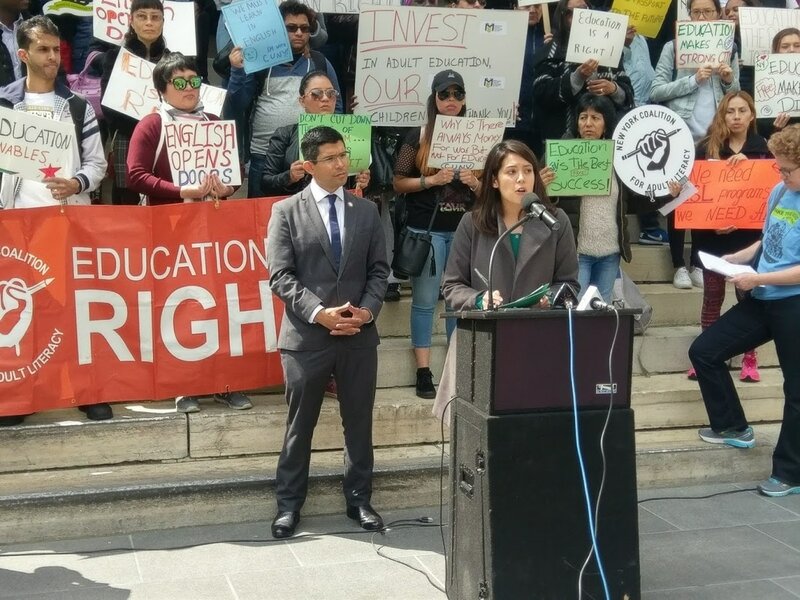 In order to make New York a true Sanctuary City, advocates say opportunities for immigrant education must be preserved and baselined in future budgets. ​NYCCAL is extremely disappointed that the Mayor's Executive budget did not baseline $12 million in crucial support for our city's adult literacy system. A failure to renew last year’s $12 million investment will leave nearly 6,000 immigrant and other adult learners without access to English and High School equivalency classes. 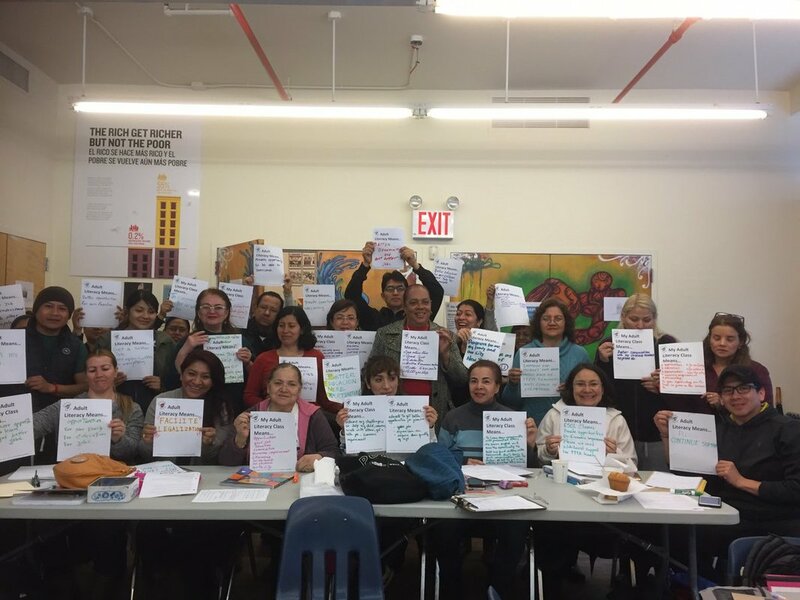 Community based adult literacy services are a key resource and are needed more than ever in the face of federal attacks on immigrant and low income communities. Adult learners need classes to be able to learn how to defend their rights, navigate complex education, health and service systems, obtain or improve their employment, and engage with their neighbors in the civic life of their communities. Community-based organizations need multi-year investments in adult literacy services with increased reimbursement rates that reflect real program costs. Our programs are incredibly cost effective and provide huge benefits for individuals and our City as a whole. 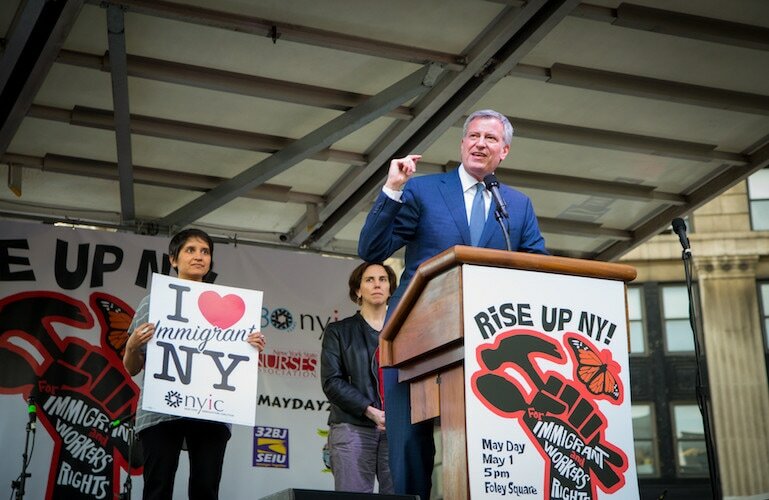 ​NYCCAL called for a City Advocacy Day of Action on April 20 to coincide with Immigrant Heritage week in New York City April 17-23. People were urged to phone, text, tweet, or email the Mayor's office to ask that city funding for adult education be maintained and even expanded. 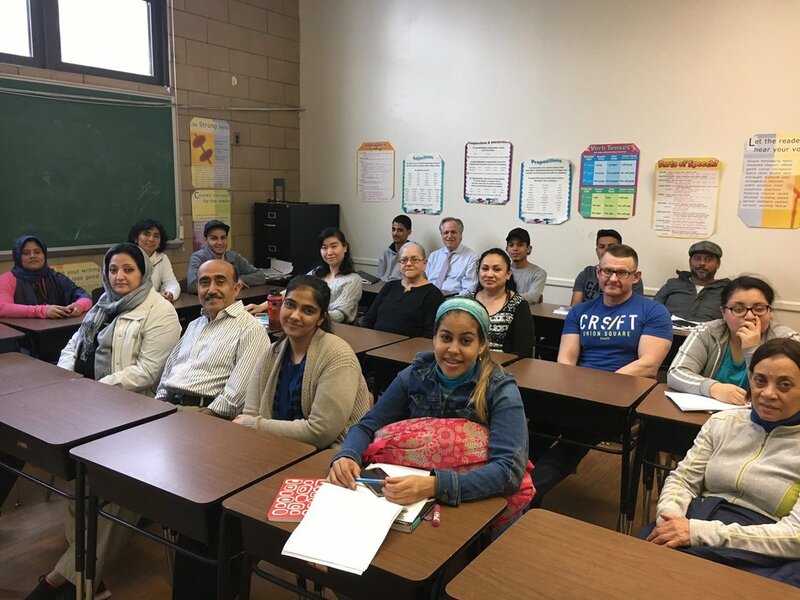 If the City doesn't renew last year's adult literacy investment, 5,700 current students will lose their seats in city-funded English language (ESOL) or High School Equivalency (HSE) classes on July 1st. In addition, 15,000 additional applicants are still on waiting lists right now to enter classes. We were tremendously pleased by the action taken with large numbers of students peaking out about why adult education funding is so important to the city as well as its citizens. On Wednesday, March 22, NYCCAL held a rally for adult literacy. Immediately afterward, at the Preliminary Budget Hearing for the Immigration Committee, NYCCAL called on the City Council to renew and baseline $12m for Adult Literacy. "In a sanctuary city committed to immigrant rights, justice, and opportunity, failing to renew this funding and closing down English language and literacy classes for the thousands of adults who would benefit from them would be an abandonment of those who are most vulnerable. " Download a PDF of the transcript here. NYCCAL held two rallies for City Funding, one at City Hall on April 7 and one outside City Hall Park on May 25. Read about our Rally at City Hall on Thursday, April 7, 2016. 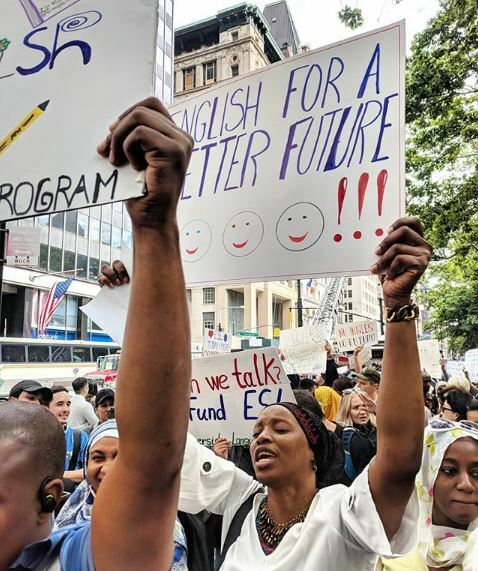 Over 300 students, teachers, and advocates rallied outside City Hall today to urge Mayor de Blasio and the City Council to restore funding for thousands of classroom seats in English for Speakers of Other Languages (ESOL), Adult Basic Education (ABE), and High School Equivalency (HSE) preparation programs. Until 2011, the non-profit American Council on Education (ACE) owned and operated the GED® test and contracted with New York State and other states to offer the GED® exam. In March of 2011, ACE joined with Pearson VUE to remake the GED Testing Service as a for-profit entity. The New York State Regents, concerned about the higher cost of the GED® exam, as well as “changes in the administration and content of the GED® test scheduled to begin in January 2014” directed the New York State Education Department to issue a competitive RFP process to seek an alternative to the GED®. Through that process, CTB-McGraw Hill was selected to develop a new exam, and in January 2014, a new HSE assessment, Test Assessing Secondary Completion (TASC), was introduced in New York State. Our recommendation: $10m investment ($3.7m expansion) in Adult Literacy Education (ALE) to create 3,000+ new classroom seats.